Raclette (the meal) consists of melted Swiss or French raclette (the cheese) served over dried meats, boiled potatoes, pickled onions, and gherkins/cornichons (see my favourite brand here). Although there are commercially available raclette warmer machines and raclette grills for home entertaining, I much prefer the traditional method of melting the cheese by an open fire. A half round of raclette cheese is placed (ie. propped) near a fire with the cut side facing the heat. As the surface of the cheese warms, a large knife is used to scrape the melted cheese onto your plate. If you don’t have access to a fire, you can use your electric or gas stove. Simply stick a long, sturdy fork into your block of cheese and hold it close to the hot stove burner. I imagine you could probably do this with a BBQ grill as well. Note: Don’t eat the rind. Luckily, it is easy to peel away as the cheese melts. This is my idea of the perfect winter meal to be enjoyed sitting around the fire place in a ski chalet (this would be great for low-key and no-fuss romance). 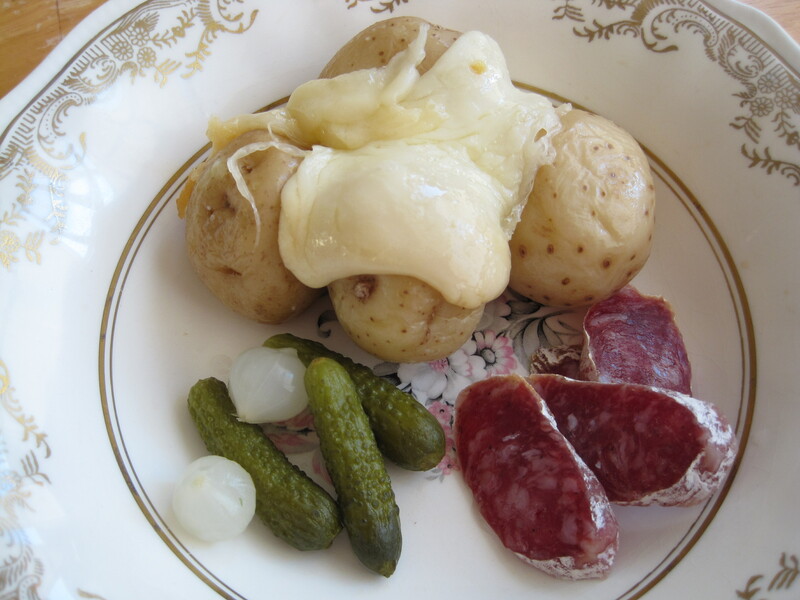 Raclette is also a wonderful way to enjoy a camp fire in the summer.